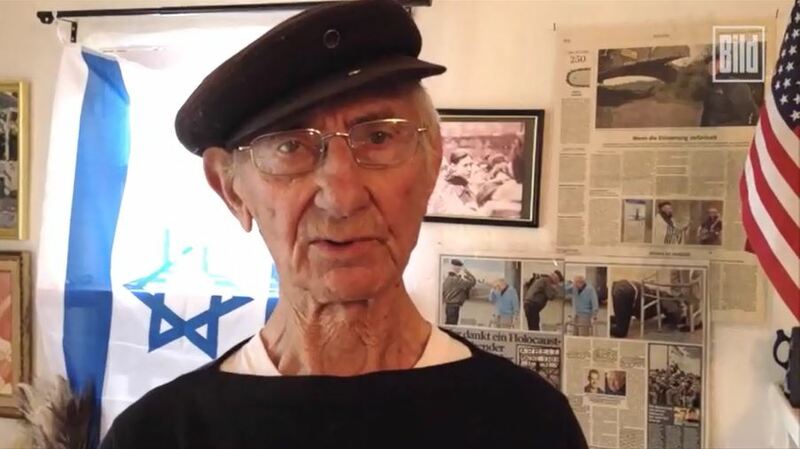 Zionist Joshua Kaufman in his home in the Los Angeles area of southern California, surrounded by two national flags and the news stories that gave him recognition pinned to the wall behind. A search in the Auschwitz-Birkenau State Museum online records revealed that Judasz arrived at Auschwitz on March 18, 1943 (over a year before Kaufman allegedly did) and was assigned the number 109023. His profession is listed as “farmer.” He was transferred to Mauthausen (in the Ostmark) in that same year and was eventually liberated from Mauthausen. Consider that the above information on Mateusz Judasz was carefully recorded and kept by the SS who ran the camp. Consider too, that he is probably one whom Jews claim to have been “gassed” shortly after he arrived at Auschwitz. I can just hear them: Von day our friend Matty disappeared. Ve learned from de talk around de camp dat evil Dr. Mengele sent him to da gazz chamber. Oy vey. Ve recited a Kaddish. Looks like Kaufman should have checked with Auschwitz about the number he selected, but he was sooo confident after the staged reunion went so well and he was featured on a double-page spread in the Daily Mail [*more on that below]. He followed up a year later by crashing the Reinhold Hanning murder trial in Detmold, Germany – and that is where his hubris may have done him in. He made rash claims about his experiences in Auschwitz and Dachau, including announcing his Auschwitz prisoner number as 109023. 2) He lied about working in a gas chamber in Auschwitz (he was never asked which one) and about being 15 years old at the time. 3) He lied about throwing fellow prisoners in a cement mixer at Dachau. 4) He lied about having to carry 50-kilo bags of cement for more than 12 hours a day. At this point, we can only wonder what else he lied about. Maybe saying he was a “living corpse” when Dachau was liberated? I somehow don’t believe that. I had already made the connection that the double page spread in the Daily Mail was published on Jan. 21 to coincide with the Jan. 27, 2015 Day of Commemoration for Holocaust victims, recognized annually at Auschwitz-Birkenau and at the United Nations. Every year, these institutions and the greater media look for (or create) holocaust-related stories to coincide with this commemoration. Because 2015 was the 70th anniversary of the so-called Auschwitz liberation, it was more important than usual to create as much fanfare as possible. And that is how it came about that Joshua Kaufman, who no one had ever heard of, had such a well-publicized reunion with one of the U.S. Army “liberators” of Dachau, Daniel Gillespie, just prior to the 70th anniversary. I have learned that The History Channel Germany discovered (how is not explained) that these two “survivors” from Dachau lived close to one another in Orange County, CA. Do they have access to concentration camp archives in order to discover these things? I suppose so. The History Channel is one of the prime outlets for WWII and ‘Holocost’ indoctrination for the Holocaust Industry. 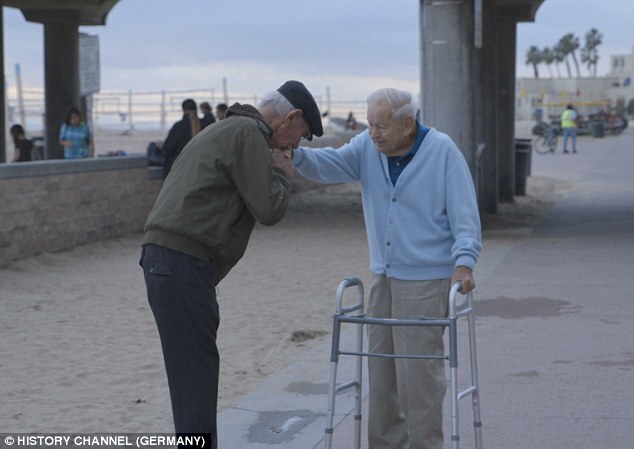 A still from the film documentary made at Huntington Beach, CA of the “reunion” of a Dachau survivor and a Dachau liberator. This appeared in the Daily Mail and other newspapers. Notice the photo credit on the lower left to “HISTORY CHANNEL (GERMANY). So The History Channel peddled the story to the Daily Mail and other news outlets in exchange for the promotion of their then-upcoming TV documentary. You can see the photos at the Daily Mail are credited to “History Channel Germany.” On another site, the same photos are credited to “Dirk Heuer, HISTORY Germany.” The photos in the Bild newspaper layout of Kaufman at home are credited to Nancy Pastor/Polaris Images, who was probably hired locally. Quite a bit of preparation is behind a feature story like this, and this reunion was surely not a spontaneous happening. I first noticed that the reunion was arranged by The History Channel Germany in this CBS-LA news story. All I could find in a search for THCG was this story. What I didn’t ever see is any mention of the U.S. Army or any official historical associations being involved with this ‘reunion.’ It was purely a commercial enterprise. in January 2015, a German documentary team discovered the two were living within an hours’ drive. When they met on a Southern California beach, they talked about the war, and survival. 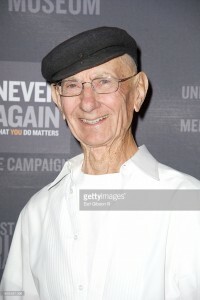 The meeting was arranged by director Emanuel Rotstein, and will be featured in a documentary, “Liberators of Dachau,” according to a press release from the History Channel. The two men were reunited by a television crew for a documentary they were making called Dachau Concentration Camp – The Hour Of The Liberators. It first aired on the History Channel on May 31st, 2015. Another question that arises is: did the United States Holocaust Memorial Museum (USHMM) play a role in this? I bring them up because it turns out that both Kaufman and Gillespie were special guests at the USHMM 2015 Los Angeles Dinner just two months later, on March 16th. That had to be because of The History Channel documentary, for which heart-warming story they were feted at the Dinner. Two months after that, Gillespie died. 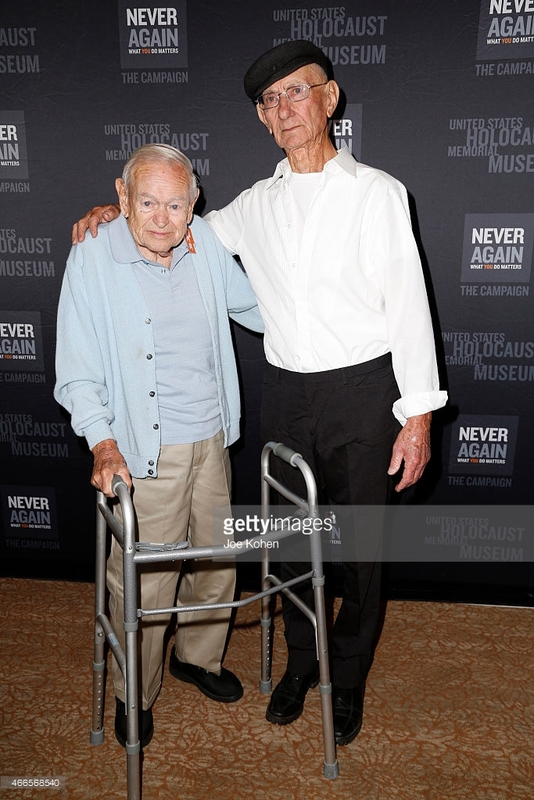 The caption at the Getty Images web page reads: Holocaust Liberator Daniel Gillespie (L) and Holocaust Survivor Joshua Kaufman attend the United States Holocaust Memorial Museum 2015 Los Angeles Dinner at The Beverly Hilton Hotel on March 16, 2015 in Beverly Hills, California. The following spring, Joshua Kaufman created another splash when he traveled to the Reinhold Hanning trial in Detmold, Germany with two of his daughters. This time there was a big write-up in Bild, Germany’s popular tabloid newspaper, and scores of U.S. news outlets. Kaufman was denied his request to testify at the trial and, since then, I haven’t found more about him. I write this to clue you in that it’s all Shoah Business. Whether Kaufman is the exact frightened prisoner Gillespie said he helped out of the latrine (this contradicts Kaufman’s statements that he “became an animal” in the camps, a violent animal who could throw other prisoners into the cement mixer), neither of them offers any material evidence to prove that. We only have their word for it. We also now have a biased television documentary directed by a Jewish-German named Rotstein (Redstone). None of this inspires confidence that it is anything more than another “heart-warming” holocaust tale to satisfy the voracious appetite of the Holocaust Industry and Holocaust public. Why be concerned about the truth of it when it’s such an inspiring human interest story. Another totally meaningless piece [personal attack deleted]. Here, she&apos;s taking her evidence from the Auschwitz-Birkenau State Museum. Well. the Jews are liers, the Holocaust is a lie (but it was awesome! ), we must not trust this filthy rats when it comes to the truth, but [she] now takes the Jews&apos; word for truth! In every other case Jews are lying, but on one particular subject they are a credible source. Poor hatemonger, you&apos;re so pathetic in your bottom way down, I feel pity for you. Who is pathetic? Andrew Uglyn has put all his shallow ignorance on display. Here, she’s taking her evidence from the Auschwitz-Birkenau State Museum. but [she] now takes the Jews’s word for truth! The only records the Auschwitz-Birkenau State Museum has in its possession are those left behind by the SS Administration of the camp. Hardly Jewish. In addition, the post-war administration of the “museum” is supposed to be Polish. Are you saying it’s all Jews? The camp was originally taken over by the Soviet Union, and then turned over to communist Poles — are you saying they were Jews? You ARE saying that. You have also previously sent several comments under various names and email addresses – even different IP addresses – which I did not approve because they had no credible content, only hate speech. I approved this one since there seemed to be some small measure of critical content about the article to which I could reply. I have my doubts, though, that you can reply in turn with a brief, on-topic answer. I will not publish a long speech or rant from you. According to Danuta Czech’s Kalendarium [a source used as official Auschwitz data -cy] the number 109023 was assigned on March 18th, 1943 to a group of 465 male (numbers from 108763 to 109227) … sent to Auschwitz from the SiPo Radom, in the General Gouvernment (now Poland). And it was a group of Poles, not Hungarians. Kaufman is not Polish, nor was he living in Poland (specifically Radom) at that time, or ever. My purpose is to show Kaufman lied about this number and I succeeded in doing that. Mr. Ugly just wants to distract attention away from that success. I really don´t understand the point of the comment by mr. U above. On a swedish website I discussed the Babij Jar mass grave. Did they ever find any forensic evidence in that pit, like they did in Katyn ? I am curious. You notice, swedish reader, that Mr. U has not replied to you, nor to me. He has only one item in his repertoire and that is to attack in a general way. He can&apos;t answer questions. When we hear from him again, he&apos;ll have a different name. Why TATTOO someone you are about to kill and CREMATE!?!??!?!?? It was fairly obvious to me that this guy was a fake from the moment I read the story on NBC "news." He looks like he&apos;s about 75 years old. Not 88. Maybe he read that advice from the Talmud that says that every Jew should live as if he himself had been part of the Exodus, but mistook Exodus for Holocaust. I don&apos;t doubt he believes everything he&apos;s saying. I read The Six Million: Fact or Fiction by Peter Winter and while he made a good case that there were no signs of gas chambers or mass graves at any of the Reinhard camps, his explanation that they were transit camps between Poland and the East weren&apos;t well explained. If these Jews were transiting east, what was their final destination and what happened when they got there? Were they released? Did they surrender to the Russian Army? Peter Hardy – I have to disagree with you on "I don&apos;t doubt he believes everything he&apos;s saying." I&apos;m sure he knows perfectly well he&apos;s lying, but he sees all the other Jews saying these things so he believes it&apos;s okay. That&apos;s what he believes — that it&apos;s perfectly okay and he can get away with it … not that it&apos;s true. He can&apos;t possibly believe he worked in a gas chamber he did not. He can&apos;t believe he was assigned a number that he wasn&apos;t. He can&apos;t believe he threw human beings into a cement mixer. Why doesn&apos;t anyone question him about such stories? The final destination of the Jews sent to the east is not fully known to us. I believe that information in the German files was destroyed by the Soviets who came up with the homicidal "gas chamber" story to frame the Germans. franklin – The bottom line is that the guy CLAIMED he had that tattoo and it ends up being a LIE. HE knew it was a lie when he said it. Everything else he says, therefore, has to be viewed with extreme suspicion. What kind of person, if they are telling the truth in general, tells such a shady lie in the process? They DON’T! When someone is caught in such a sleazy falsehood as part of their story – it then becomes evident that they cannot be believed about ANY part of the story. This is yet another example of a self-serving and sinister liar seeking glorification, recognition and sympathy – when they KNOW DAMN WELL that they’re LYING to us. Its sleazy beyond description. Its enough to make a decent, honest person sick – just like Wiesel and Isblat and all the rest that have told nauseating lies. Only scheming, plotting cockroaches do this kind of thing. Its sickening. I wrote: 4) He lied about having to carry 50-kilo bags of cement for more than 12 hours a day. about Mühldorf, the satellite camps he was in. What I’m sure about Joshua Kaufman is that he spent a lot of time reading the USHMM and other Holo promotion sites to get the stories he has told.